It’s difficult to escape the whispers about Gazi when travelling in Athens – and for good reason. The Gazi neighbourhood, often knows as “the gasworks”, has a well deserved reputation as one of the coolest nightspots in Athens. Clustered around the old gasworks turned Technopolis, the former downtrodden neighbourhood is full of eclectic character and heart. 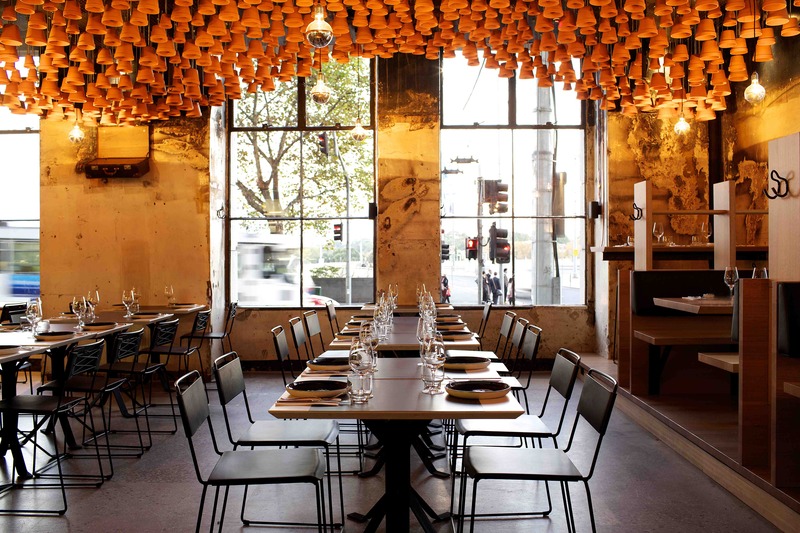 Named after the Athens hot spot, Gazi on Exhibition Street(the brainchild of George Calombaris) certainly lives up to its name. The former Press Club space has been beautifully converted. Sitting somewhere in the middle of the spectrum of casual and fine dining, Gazi is modern and stylish, roughed up slightly with industrial faux fittings like exposed pipes and ink splattered walls. But the most impressive feature is the terracotta pot plants hanging like stalactites from the ceiling. resembling waves in a terracotta sea. 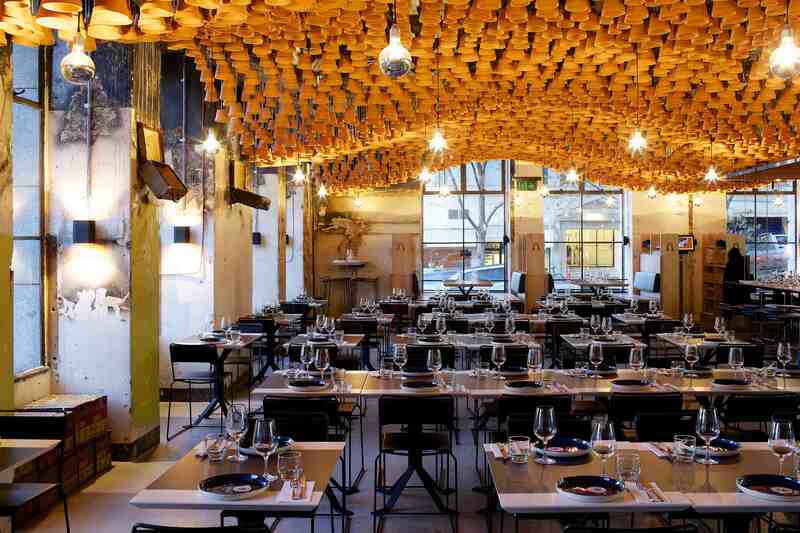 Gazi cleverly encapsulates elements of its Greek heritage ,not only in its food but its in decor – with splashes of blue and white dotted throughout the venue, testament to the Greek flag. Even the plates sport the Greek matiasma “evil eye”. The Greeks believe the matiasma wards off evil spirits and misfortune caused by the envy of others. 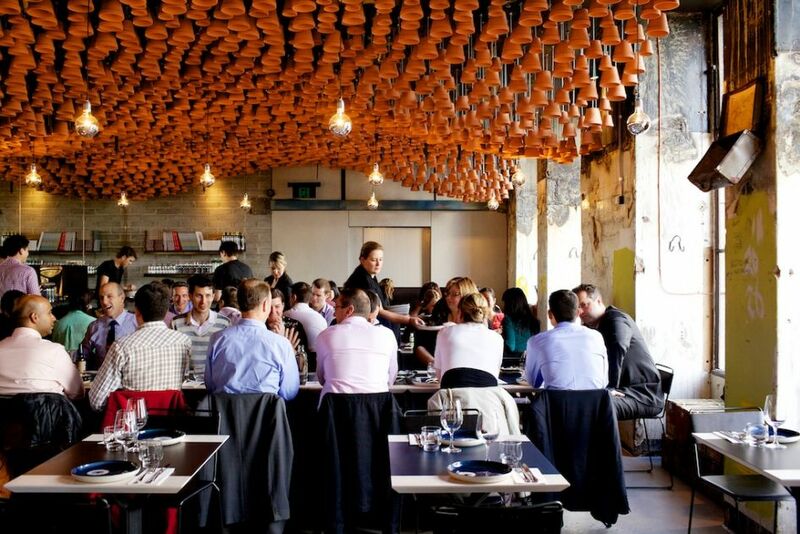 Like most casual dining venues in Melbourne these days, the menu combines both small and big plates, designed to share. You can expect hearty Greek classics, like souvlaki and saganaki as well as freshly cooked meat straight from the spit. If you’re feeling hungry, try “doing it greek style” with a ten course sharing menu. Perhaps something to try for next time. We started with the pastichio kroketa ($3.50) which were heavenly golden parcels of deliciousness. The thinly crumbed morsel exploded with flavour upon every mouthful, literally oozing with a splendid mix of macaroni, kefalograviera and pork and beef mince. The deep-fried local calamari ($16.50), cutely assembled in a paper cone, took me back to a seaside taverna in the Greek islands somewhere. Delicately seasoned with salt and pepper, the calamari were cooked to perfection and superbly tenderised. The mary rose sauce was the perfect dipping companion. Straight from the wood fire spit and grill, a selection of lamb cutlets and whole roasted chicken were presented at the table. The wood fired chicken was one of the stand outs of the evening, the slightly crispy skin basted beautifully with a citrus dressing and meat that was so tender it literally fell apart from the bone. Resting on a bed of white beans and a capsicum and feta puree (tirokafteri), it was simply divine. Unfortunately the lamb was unevenly cooked through, quite blue near the bone which even pushed my limits of what is defined as rare. A popular dish in Greece, the Lahanosalata ($12) (cabbage salad) was given a modern twist with the addition of orange segments, raisins and pomegranate molasses. The toffee citrus notes of the molasses combined with finely shredded cabbage was an unexpected surprise. Clearly my eyes were bigger than my stomach when I ordered the Bombe metaxa. Be warned – the serving is huge! Greek easter bread (tsoureki) was piled generously with mounds of chocolate ice-cream and wafer. Finally covered with Italian meringue, the spherical pastiche was then drizzled with brandy and flambed at the table by our lovely waitress. 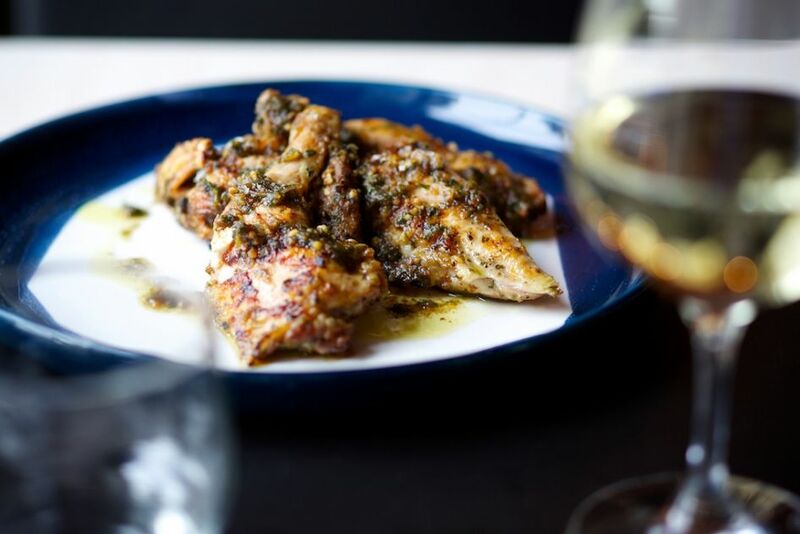 There is something special about Gazi which is likely to keep diners returning for more and more. Good quality, hearty Greek food, combined with a fun, casual dining atmosphere is definitely a winning combination. The fact that George himself is constantly seen in the kitchen is a good sign. Dirty Hellenic street food at its finest. Approximately $60 per head including food, wine and service. Really wanted to book in for the restaurant last time in Melbourne but had no luck. It sounds gr8.